Specs: Pacific coast beach, islet hopping, surfing, waterfalls, oldest Balete tree, historical landmarks, shopping, sightseeing. There are 2 ways to get to Baler by land. From Cabanatuan City in Nueva Ecija, you can take the Baler-Bongabon road or the Canili-Pantabangan road. • Option 2 – Drive to NLEX then take the Sta. Rita exit. Drive on the main road passing through the Bulacan cities of Plaridel – Baliuag - San Idelfonso - San Miguel, then Gapan – Sta. Rosa – Cabanatuan Cities in Nueva Ecija. As of this writing, the Baler-Bongabon road is only passable by 4x4 vehicles. One has to manage 2-3 hours through the zigzag mountain roads of Sierra Madre. From Cabanatuan City, take the Maharlika Highway and turn right on Aurora road, pass through Palayan City – Bongabon – then turn right to Sierra Madre forest. You will emerge in San Luis then just drive straight to Baler. The recommended route is the Canili-Pantabangan road. From Cabanatuan City, take the Maharlika Highway to Talavera – Rizal – Pantabangan – Alfonso Castaneda (part of Nueva Vizcaya) and then to Canili, Maria Aurora. From Maria Aurora, just drive straight to Baler. This road will pass by the scenic dams of Pantabangan and Canili. • Option 1 – Genesis Bus direct to Baler. Just go to their terminal in Cubao (tel. 4211413) or Pasay (tel. 8533115). Bus leaves every hour from 4:30am till 3:00pm. Travel time is about 7 hours. Fare is around P400. • Option 2 – Ride a bus to Cabanatuan then take another bus bound for Baler. Airconditioned buses traveling to Cabanatuan are Baliwag transit, Genesis, Five Star, ES. You may also take other buses bound for Northern Luzon provinces like Aparri and Cagayan (North) which will pass by Cabanatuan. From Cabanatuan central transport terminal, take a Baler-bound bus (D’Liner, Genesis) or van. Buses going to Casiguran, Aurora may also pass by Baler. Travel time is about 8 hours. Fare is around P200.
. 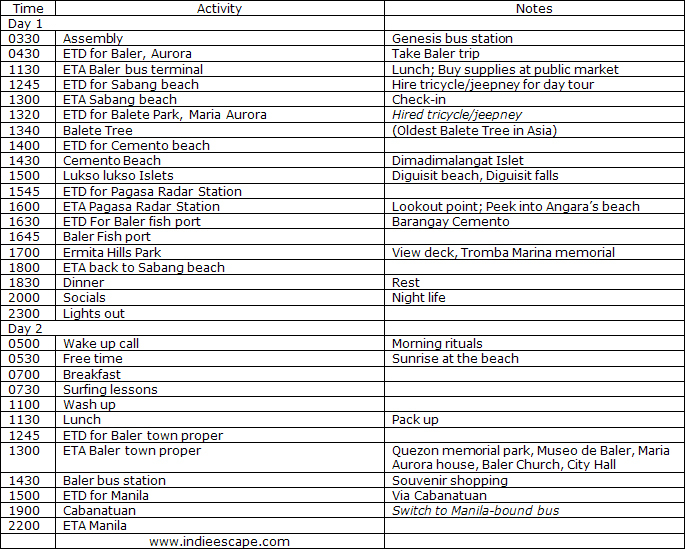 This itinerary is best for first time Baler visitors staying overnight, most likely on a weekend. The best time to visit is during November to May (November to February for surfers). Or as long as there is no weather threat.
. Contrary to common knowledge, Baler is not a part of Quezon Province any longer - and has not been since the 50's.
. It’s important to be at the bus station early to save yourself a seat.
. If you’re driving your own car, make sure you fill your tank full by the time you reach Cabanatuan Area because gas prices go up as you drive farther.
. Make sure you bring enough cash as well, because there is only one ATM in Baler.
. Try to drop by the tourist information center in Baler to get a city map for free. This will be handy when you do the town tour next day.
. For lunch, you can try MJO restaurant or the carinderias (hole-in-the-wall-eateries) around Baler bus station, particularly in the public market side.
. It’s a good idea to sign up for surfing lessons upon checking in your room, to save your slot.
. There is no entrance fee to Balete Park to see Asia’s oldest Balete (Banyan) tree.
. A tricycle day tour should cost about P500 up while a jeepney should be around P2000 – just an estimate since it still depends on how many places you plan to visit.
. Make sure you don sun protection during islet hopping.
. A tricycle may be iffy going up to the Pagasa weather radar.
. Dicasalarin beach is privately owned by Senator Angara. You can access the beach via pump boat arranged through Bahia de Baler resort.
. If you’re lucky, you can catch some fishers selling their catch at Baler fish port.
. You can take your merienda (late afternoon snack) to Ermita Hill Park. It offers a stunning view of Baler bay.
. If you feel like going out at night, check out Bay’s Inn restaurant or Bahia de Baler bar and grill.
. Make sure you wake up early the next day to see the sun rise from the Pacific.
. Surfing lessons start at P300 per hour and surfboard rental starts at P150 per hour.
. The Baler town tour can be done on foot. There are no entrance fees to any of the mentioned spots.
. Before leaving for Manila, drop by the pasalubong center just next to the bus station for native goods. Best buys are: walis tambo and woven products (hats, fans, bags).
. Driving your own car can be more costly if you consider the gas expenses. Try to balance it out by getting more people to come. After all, it’s much easier to go around Baler using your own vehicle.
. If you arrived in Baler earlier than expected, you may do a side trip to Ditumabo Falls aka Mother Falls in San Luis.
. You may also choose to have lunch in one of the home cooked food shops in Sabang but this may take more time from your itinerary.
. Hotels accommodations and homestay options are listed in Aurora Province’s official tourism website here.
. If you wish to extend your stay, I suggest you explore the beaches up north – Dipacuilao and Dinadiawan.
. If you took a private car, make sure you make a stop over at Cakeland (café, cake and pastry shop) in Nueva Ecija for pasalubongs! Itinerary and expenses recorded on May 2011.